Tutorial on Data Modeling, Data Warehouse & Business Intelligence! Dimensional Data Modeling Training @ Rs 8750 / Training Videos for sale!. Please contact AntonysTrainingandSolution@gmail.com or 91-9080157239 for more details! What is Entity Relationship Diagram (ER Diagram) or ERD? Entity Relationship Diagram (also called as ER Diagram, ER Model, ERD) contains entities/attributes and relationships with those entities. ER Model is a methodological approach to create entities in normalized forms to minimise redundancy. 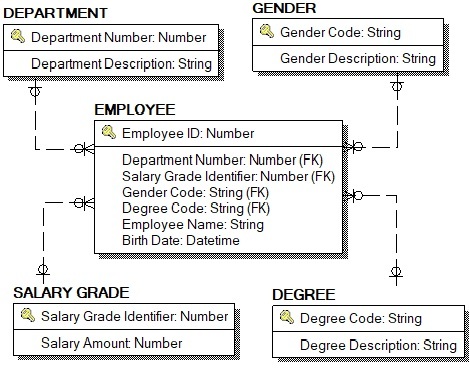 It is drawn with the use of Data Modeling Tools and the following steps are done to create the entity relationship diagram. Data Modeler designs the ER diagram. 2. 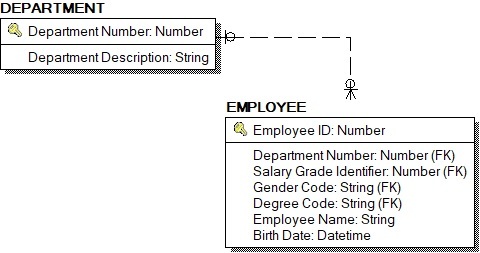 Then the data modeler adds the relevant attributes to those entities. 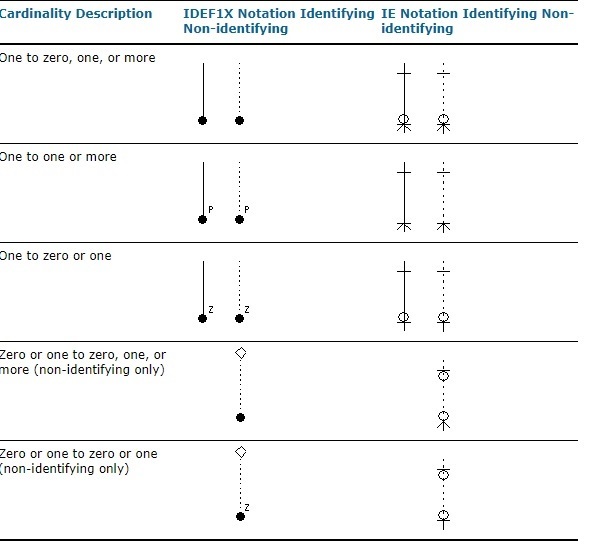 In The below ER diagram created from Erwin Data Modeling Tool by using Information Engineering (IE) notation, near to that department entity, one can see ZERO and ONE and near employee entity, ZERO AND ONE AND MORE. These symbols have specific meaning and the data modeler has assigned the right symbols due to business rules. Similarly, entities are created in ER diagram and the data modeler gets the approval from the business team, technical to release the data models. Oracle has released “SQL Developer Data Modeler” and it is a free data modeling tool. If you want to become a data modeler, you can start designing data with “SQL Developer Data Modeler”. With Erwin and PowerDesigner, you can get the trial version. If you are interested to learn data modeling by using Erwin or SAP PowerDesigner or Oracle SQL Data Modeler, please reach us for more details – Training@learndatamodeling.com or 91-90801 57239. For Syllabus and other details, please click here. Click here to take the Quiz - Test your knowledge and skills in OLTP / Dimensional Data Modeling!! !